"The Balanced Embouchure" is a unique approach to the fundamental challenge of playing brass wind instruments. At the core of the method is a series of dynamic range-of-motion exercises which affect lip position. Mechanics - a detailed look at all embouchure elements - lips, tongue, and air. Philosophy of Teaching - focusing on learning universal principles and letting the unconscious mind do the rest. Health - the least invasive ways to maintain your health and well-being. Performance - overcoming fear by looking at the bigger picture. Hardware - horns and mouthpieces, philosophy and products. Exercises - Thirty pages of exercises, including the fundamental range of motion exercises [Roll-Out, Roll-In], 17 specifically designed Lip Slurs, Double Tonguing exercises, and other exercises that are difficult to explain in this short space. Included are photos and text which explain in depth how the exercises are done, step-by-step. Finally, most of the exercises are performed by my students on an enclosed CD, so that there is no guesswork regarding how the exercises should sound. When you hear kids playing them easily, it gives you confidence that you can too. Lesson Plans - samples of how the exercises are organized in a practice routine. Troubleshooting - the information here is alone worth the price of the book. Topics of discussion include focusing the double pedal sound, keeping the rolled-in lip position from collapsing, the broken embouchure, protruding top lips, big lips, braces, throat tension, excess mouthpiece pressure, double buzzing, and so on. Although I am a trumpet teacher - and the book is optimized for trumpet - the exercises also apply to French Horn, Baritone, Trombone, and Tuba. For those instruments, it just takes a little extra tweaking, primarily because of the differences in mouthpiece size. So far, French Horn has the most documented "tweaks." For more details, look at the Testimonials and Resources pages. Look over to the left, and you will find links to several chapters from the book. This will give you a taste of how it is written. "I've been doing BE for five years now, and it has completely changed the way I play, the way I teach and my whole perception of how to play the trumpet." "I am SHOCKED that your system has not taken the brass teaching/playing world by storm." "I think your approach makes a great deal of sense. You've packed an amazing amount of useful material into a very concise book." "After years of fear and struggle with my playing, I discovered your book and this one has changed my playing and my life." "I have been using your book with many of my students for about a year now (I also use it!) and I am having INCREDIBLE SUCCESS with your suggestions, thoughts, and theories with all of my students." 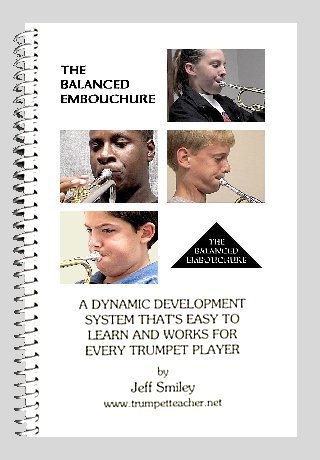 "...I wish this book had been available to me when I first started playing trumpet. You will still need other method and etude books like Clarke's, Charlier, Laurent, Bugs Bower, Arban and books on scales and chords, etc., to develop all the musical and technical skills required on the trumpet. But the Balanced Embouchure will give you what none of those others do: the ability to play the notes that are in those other books." "At age 57 and after 14 months of doing the RI/RO exercises and incorporating the Zip idea into the flexies that I do daily, my understanding and experience of playing a brass instrument has been thoroughly revolutionized and transformed." "Thank you for your time and your book. I can't understand why this method isn't being taught everywhere... "
"If someone asked me to sum up my experience with BE, I'd say something like, "I bought a trumpet when I was 51 years old, and three years later I'm hitting 4th ledger line G above the staff. Any questions?"